steel guitar hall of fame? Topic: steel guitar hall of fame? Where is the steel guitar hall of fame located? Is that the place where Lloyd Green's "lightning bolt" Sho-Bud is? There is no Steel Guitar Hall of Fame location. The plaques were always displayed at the Millenium hotel. Even though the intent was to have a REAL HOF building, it never panned out. Now the plaques are in storage with the Scott's. As far as Lloyd's steel. It was on display at the Country Music HOF in Nashville. I do not know if it is still there or not. I could not find a picture of it on the HOF web site. Lloyd; just messaged me about this inquiring. 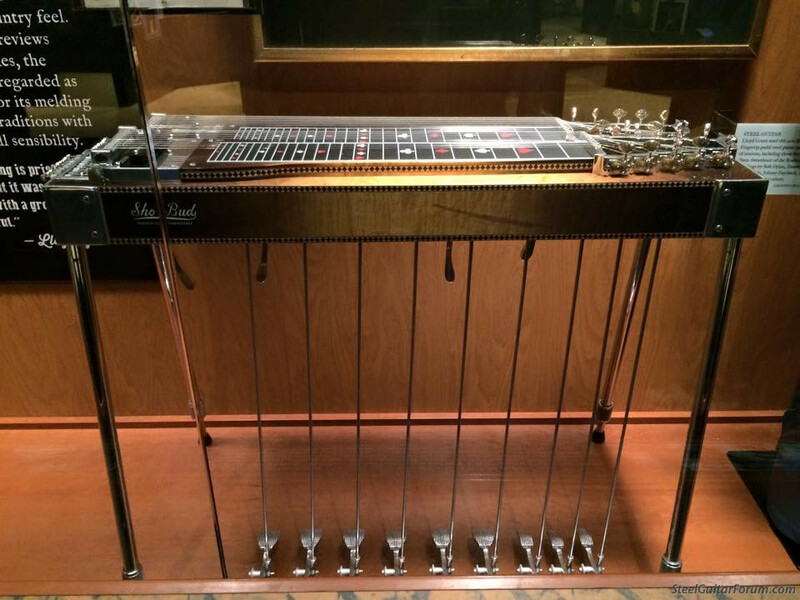 Yes Lloyd's "Lightening Bolt" Sho~bud Fingertip pedal steel guitar that I restored; is on Permanent Display at the Country Music Hall of Fame in Nashville. 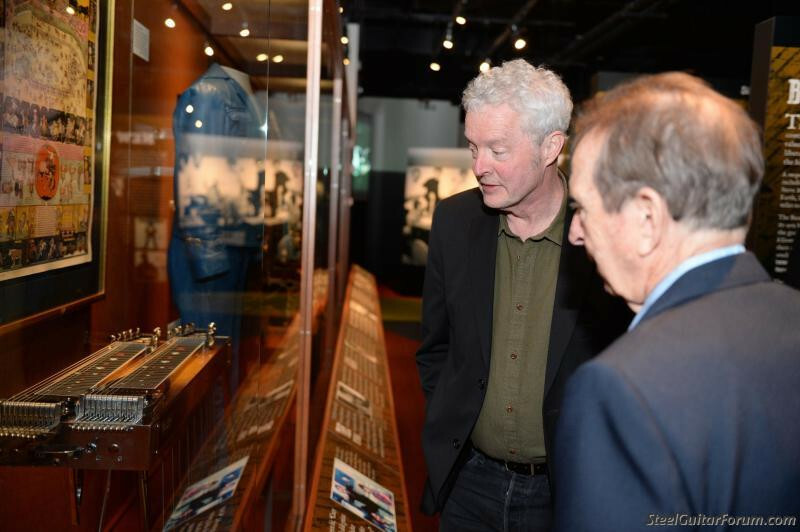 It was on display in the HOF museum as part of an exhibit and will now continue to be a piece of Country Music history for all to visit and see. Here's Lloyd looking at it with Pete Finney. Carl, Lloyd told me once that when they did the Panther Hall album they had a couple cold ones and then threw the charts away and flew by the seat of their pants. That album is as close to flawless as you can find in a live album. Yes Carl; that Fingertip is one he played on Charley Pride's "Live at Panther Hall" in Ft. Worth 1969. Also Same Fingertip he played on The Byrds "Sweetheart of the Rodeo" 1969 Album. And see this beautiful/Famous "Lightening Bolt" in Person. Thanks for that “inside” info...the band was sure on fire that night in Panther Hall! What an inspirational gift during the Golden Years/Era of country music. Thanks Carl and Don for the kind words. Your "chime-in" is most welcomed! I too would enjoy hearing Mr. Green's thoughts regarding this show. I read somewhere that he used a Fender Twin Reverb amp (not sure of the year model) that was loaned to him by a local music store. It's a shame that the plaques are just setting somewhere in storage. It would be good if at least family members could get them. And maybe some have. I believe that there were 2 plaques made for each inductee, one for the HOF to hang and the other one for the inductee and/or his/her family to keep. In the early days, yes. But towards the end, when the plaques became considerably more expensive to manfacture, one plaque was made for the HOF, and the option to purchase one was offered to the player or family, with a photo of the plaque provided otherwise. This was Scotty's decision, since he controlled the purse strings. If nobody minds my asking, what is the history of the mark on the front apron? Barry it is an inflection in the Wood that AJ Nelson thought was cool and they decided it looked like a "Lightening Bolt" and kept it. Interesting thread. 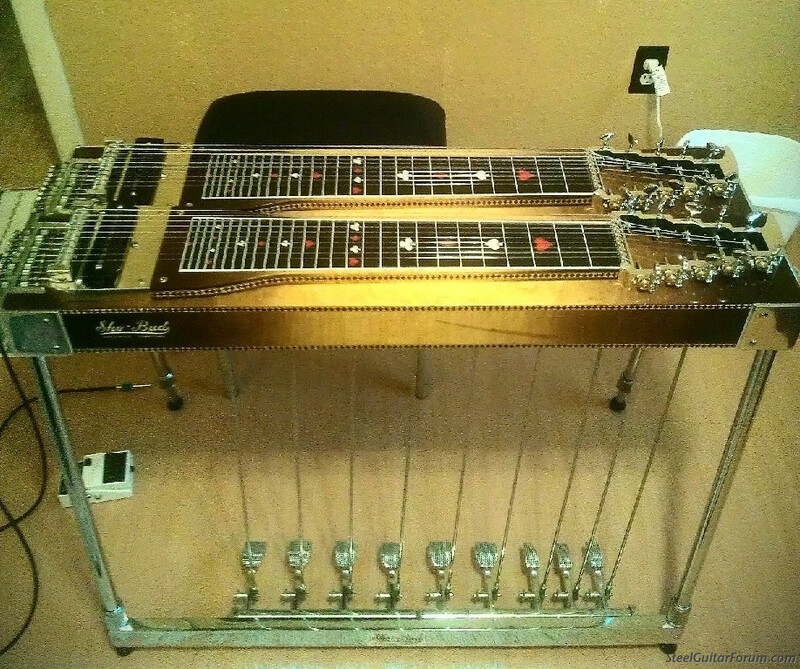 The steel guitar hall of fame has always been perplexing to me. The chronological order is the most perplexing. Sonny Garrish should have been inducted before me and many others. Dont get me wrong, I'm extremely honored to be a member. I also have to wonder what the steel guitar hall of fame fundraisers were to contribute to. Maybe to pay for the plaques? My wife snapped a few pics of my hall of fame plaque after the ceremony. Thankful for that. With no venue to display the hall of fame plaques, it seems like it never happened. Such a pity, as we , the latest inductees have no proof it happened other than an iphone pic or an out of date website. I also have to wonder what the steel guitar hall of fame fundraisers were to contribute to. Maybe to pay for the plaques. My wife snapped a few pics of my hall of fame plaque after the ceremony. Thankful for that. With no venue to display the hall of fame plaques, it seems like it never happened. Such a pity, as we , the latest inductees have no proof it happened other than an iphone pic or an out of date website. Danny Hammers was maintaining a copy of the SGHOF web site. Recently he handed that over to me, and I added it to b0b.com. It's at https://b0b.com/wp/?page_id=4061. I still think the Musician's HOF in Nashville is the perfect place for the Plaques. They are not doing anyone any good now packed up in storage. I certainly agree. I think that it would help preserve the music of these master steel players as well as their names. Thirty years from now, it would be a shame for some twenty-something year old hot steel player to say "Buddy whooo?" or "John Hughey? Who is he?" Every time I play, I play licks that I have copied from these two master players and other master players as well. And Tommy, if you're still following this thread, that includes you too. I hate to be such a thief, but what these players came up with is so much better than what I can come up with. But I'm always quick to point out who I copied the lick from because when I copy them, I'm riding their talent, not mine. Thank you so much for having a site dedicated to the hall of fame! I agree with Jack Stoner. I would like to think one of the other Steel Guitar Shows could pick up the job of forming a committee to accept nominations and induct some more qualified Steel players and innovators. People that have contributed to the promotion of the Steel Guitar. For instance bOb. Maybe Marty Stuart would be interested in having the plaques...? There should CERTAINLY be a wall/section...etc...in the Country Music Hall Of Fame in Nashville, TN for the Plaques of the Steel Guitar Hall of Fame members as: "The Steel Guitar is the Defining Instrument of Country Music"(not guitar; Not Fiddle; Not Harmonica...NOT ETC........but YES; the STEEL GUITAR DEFINES Country Music......PERIOD!!!! Well Ricky, that might be true...for some of us. But, not for the Nashville politicians and producers these days. I must admit I was rather dumbfounded when the Tennessee State Quarter came out...and it didn't have a steel or Dobro pictured on it. It did have a trumpet. Oh, don't tell me...the Governor's favorite country song of all time was "Ring Of Fire". The SGHOF inductees are there for their contributions to or with the Steel Guitar, thus the Musician's HOF is the more appropriate. Yes Good Point Jack... and ha.....Donny...I know, Right. But yes the steel guitar can and has been in many different featured songs from many different lables of music; NOT just Country. So yes it needs it's OWN Hall of Fame. But Lloyd and we decided that the famous Sho~bud he recorded through 60's era; should continue to be a featured piece of History in the CMHOF in Nashville...to continue the display of History behind it. 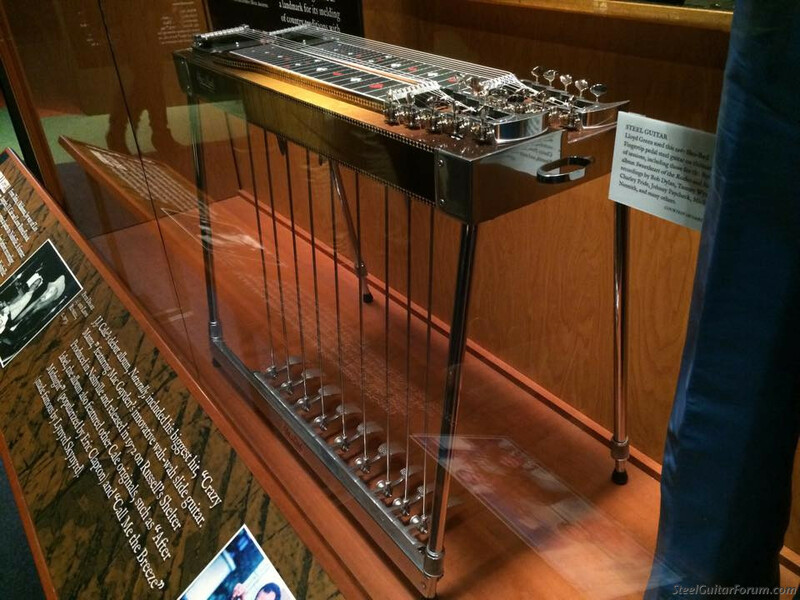 So at least there is some Steel guitars being displayed in the Country Music Hall of Fame for future on goers to enjoy.